Mike Squires is a marketing and sales executive with 12 years focused on e-Healthcare initiatives that helped physicians change the way they work for better patient care. Experienced in introducing new online products to physicians, healthcare professionals, and the pharmaceutical and medical device industries with innovative sales and marketing strategies at start-up and traditional healthcare publishers. Helped position Medscape as the market leader to the industry and accelerate e-product offerings of Elsevier’s International Medical News Group and F-D-C Reports. Directed marketing, sales, client relations, sales support, and implementation of medical education and promotion programs. Entrepreneurial and enthusiastic; excellent mentor and motivator. 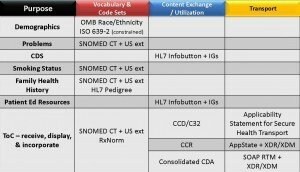 Posted on January 25, 2013 on ONC Health IT Buzz blog and reposted on eHealthcareMarketing blog. Health information exchange (HIE) is not easy. ONC has sponsored expert research on various technical and business-related health information exchange topics, because we know that professionals engaged in implementing health information exchange must possess business acumen and technical expertise, on top of policy savvy and many other competencies. Without these skills there are many ways to overreach, or just as perilously, under reach, resulting in failure to maximize the long-term value of services offered through health information exchange. The ONC-sponsored research will provide health information exchange implementers, policymakers, and researchers with a heightened understanding of several high-impact services that can support the sustainability of health information exchange organizations. To execute this work, ONC contracted with Audacious Inquiry , a health information technology services company. These reports will support the State HIE Program’s grantees as they continue to implement health information exchange, which increasingly includes launching query-based exchanges. One of the most revealing aspects of this report is a chart contrasting six successful HIEs with two shuttered organizations across nearly 24 data points. One of these data points is the average number of patient record queries per month that each entity is receiving or had received. Those HIEs that are considered successful have figures ranging from 1,548 to 333,333 per month, while the closed HIEs had between 167 and 250 queries per month. The report also considers specific lessons from the experience of these health information organizations. It details the challenges of hiring and retaining a chief executive who is responsible for strategic vision, sales, marketing, day-to-day operations, and complex technical implementation projects. The research found that on top of all this, the leader might only receive a modest salary relative to her private sector counterparts. 2. REPORT: Health Information Exchange-Driven Notification & Subscription Services. While health information exchange is not easy, it need not be overly complex. One theme that runs throughout the research is that basic tools can be used to support sophisticated use cases. The report on HIE-Driven Notification & Subscription Services provides a review of the technical considerations involved in enabling push messages to providers. While these messages are a relatively simple technology, they can be used to support the advanced care coordination requirements of new payment models such as the Centers for Medicare & Medicaid Services’ Accountable Care Organizations. The report uses, as an example, the Indiana Health Information Exchange (IHIE)’s ability to send hospital admission alerts and discharge summaries to primary care providers. Such tools will be essential as hospitals begin to face negative financial incentives for readmissions, such as through CMS’ Readmissions Reduction Program. The report also touches on how IHIE is developing a pilot that will allow managed care organization case managers, as part of their care coordination efforts, to receive notifications when their members are admitted to a hospital or visit an emergency department. Another important aspect of health information exchange is provider directories. While they are not glamorous, they are ubiquitous, and they can be highly valuable. On the most basic level, a provider directory is a type of electronic white pages that allows one provider to look up contact information for another provider. The report on Provider Directory Solutions covers the key concepts associated with the technology. However, it also describes several additional use cases, such as how they can be used for future health benefits exchanges or for state licensing boards. Yet, the report goes even further by supporting the idea that the profit potential of provider directories is likely to go beyond the fundamental requirements of clinical health information exchange. Such considerations are critical for the State HIE Program’s cooperative agreement partners as they seek strategies to attain sustainability beyond the grant period. The report on Master Data Management within HIE Infrastructures explores the technical aspects of the tools that can help HIEs accurately capture and coordinate a patient’s identity. In short, master data management is how two pieces of electronic health information are appropriately merged or kept separate, which is particularly challenging when there are varying levels of data quality on patient identities. The report also considers how master data management tools can be employed for advanced uses, such as data analytics associated with new payment models or patient centered medical homes. This work was overseen by the State HIE Policy Office, which is part of the State HIE Cooperative Agreement Program. ONC plans to release additional reports in the future. For more information, contact ONC Program Analyst John Rancourt or ONC Program Manager Lee Stevens. “In 2nd Look, Few Savings From Digital Care Records” (Business Day, Jan. 11) reports on the recent RAND study’s findings that the use of electronic health records has not yet reached its potential." How do electronic health records (EHRs) connect you and your doctor? Infographic accessed from www.healthit.gov on 12/12/2012. "In the past, medical data was only stored on paper, making it difficult for your health care providers to share your information. Between 2001 and 2011, the number of doctors using an EHRsystem grew about 57%, making it easier for you and all of your doctors to coordinate your care, and often reducing the chance of medical errors. Where are electronic health records headed? In this Infographic, view the history of electronic health records and see how they may improve your health and health care in the future." Reposted on e-HealthcareMarketing.com on December 22, 2012. Earlier this year, ONC issued a request for information regarding a potential governance mechanism for the nationwide health information network. Based on the comments and feedback we received from multiple stakeholders, ONC announced in September that we would not be issuing federal regulations. Instead, we committed to launch a range of activities to support existing governance initiatives and advance governance goals of nationwide health information exchange: increase interoperability, decrease the cost and complexity of exchange, and increase trust among participants to mobilize trusted exchange to support patient care. Below, are some of the activities ONC is undertaking to promote emerging good governing practices within and across communities. Today, we are issuing a new Funding Opportunity Announcement (FOA). The FOA will allow ONC to work collaboratively with entities already involved in governance of health information exchange to encourage the continued development and adoption of policies, interoperability requirements, and business practices that will increase the ease of electronic health information exchange, reduce implementation costs, and assure the privacy and security of data being exchanged. In January, ONC will host an open listening session on governance of health information exchange, to provide opportunities for a wide range of stakeholders to describe their issues, priorities, and critical concerns. Building upon this input from stakeholders, the HIT Policy Committee and HIT Standards Committee will hold a public hearing on January 29, 2013, to further discuss the current state of health information exchange. The hearing will highlight the significant amount of exchange activity that is occurring today and the practices that enabled or impeded it; the health information exchange opportunities and needs of providers as they take on new payment models; the nature and scope of governance policies and practices of entities currently providing governance to different types of exchange communities, the impact of governance on information exchange, and the opportunities to strengthen governance at multiple levels. In the first quarter of 2013, the National e-health Collaborative, through our cooperative agreement, will convene key stakeholder governance entities. These entities, whose decisions establish policies and practices for a given community of exchange partners, will work throughout the coming year to identify key issues and common problems in the governance of health information exchange and the best ways to address them. ONC plans to publish a series of governance guidelines for effective and trusted electronic health information exchange. Through this effort, ONC hopes to guide emerging governance models on the policies and practices that should be considered as part of their approach to governance. ONC will also launch a monitoring program to ensure the governance goals are being addressed. ONC will be holding a technical assistance call on January 7, 2013, at 2:00 pm EST for applicants interested in applying for the FOA. The overarching goal for ONC remains that the information follow the patient where and when it is needed, across organizational, vendor, and geographic boundaries. We hope that you agree that we have initiated a robust series of activities to accomplish this goal. We look forward to your input as we move forward. It will take all of us to be successful. The Exemplar Health Information Exchange Governance Entities Cooperative Agreement Program (Program) seeks to support a collaborative exchange within existing private or public sector organizations that have already established governance of health information exchange. The purpose of the Program is to work with existing governance entities to further develop and adopt policies, interoperability requirements, and business practice criteria that align with national priorities, overcome interoperability challenges, reduce implementation costs and assure the privacy and security of electronic exchange of health information. By advancing and further developing existing health information exchange governance models, this Program promises to increase the level of secure electronic health information exchange in the nation. Section 3011(a) of the Public Health Service Act (PHSA) authorizes the Secretary to invest in the infrastructure necessary to allow for and promote the electronic exchange and use of health information for each individual in the United States consistent with the goals of the Federal Health Information Technology Strategic Plan: 2011-2015, and more specifically, support the nationwide electronic exchange and use of health information in a secure, private, and accurate manner. Total funding available for this initiative is $800,000. This funding opportunity announcement (FOA) will advance collaboration within private or public sector organizations that have already established governance of health information exchange. The purpose of the Program is to work with existing governance entities to further develop and adopt policies, interoperability requirements, and business practice criteria that align with national priorities, overcome interoperability challenges, reduce implementation costs and assure the privacy and security of electronic exchange of health information, in a manner consistent with section 3011(a) of the PHSA. As a cooperative agreement, as opposed to a grant, this award instrument of financial assistance ensures substantial involvement between the Office of the National Coordinator for Health Information Technology (ONC) and the recipients during the performance of the project. ONC had previously considered proposing the establishment of a voluntary accreditation process for the governance of health information exchange through a rulemaking process. A Request for Information (RFI) solicited feedback on whether ONC should establish this voluntary program and on the specific rules of the road that exchange entities should follow. Several of the responses to the RFI pointed out that there are already organizations engaged in health information exchange governance activities, and that ONC should work with these entities rather than set up a new process and program. Based on these and many other comments received, ONC decided not to pursue a governance approach through rulemaking at this time. Instead ONC is establishing a robust framework of leadership, guidance, engagement, listening and learning, and monitoring. We will identify and shine light on good practices that support robust, secure and interoperable exchange. We will actively engage with entities currently serving in governance/oversight roles to promote emerging good governance practices. We will continue to use our existing authorities and convening powers to create consensus and provide guidance and tools to address specific barriers to interoperability and exchange. We will continue to evaluate how and what consumer protections can be appropriately applied to health information exchange through existing regulatory frameworks. We will continue to monitor and learn from the wide range of activities occurring. This FOA will enable ONC to work collaboratively through the cooperative agreement process with existing entities undertaking governance activities for the electronic exchange of health information to encourage them to develop and adopt scalable national policies, interoperability requirements and business practice requirements that reduce the cost and complexity of exchange, obviates the need for cumbersome legal agreements and reduces the cost and complexity of health information exchange, . The FOA is focused on working with existing governance entities to expand their rules of the road (i.e. policies, interoperability requirements and business practice requirements) for participating organizations. This work will support and advance the efforts of existing governance entities which will benefit consumers and providers by allowing health information to flow securely between unaffiliated healthcare organizations. ONC will enter into cooperative agreements with up to four awardees whose primary role is providing governance for participants’ directed “push” and/or query-based exchange. Applicants may address one or both of the exchange models. ONC is interested in funding at least one applicant that will provide governance for each exchange model. ONC will work with each awardee through the cooperative agreement process to determine the set of policies, interoperability requirements and business practice requirements that will be addressed under this cooperative agreement. Once the Exemplar Health Information Exchange Governance Entities cooperative agreement(s) are awarded, ONC will encourage State HIE Cooperative Agreement grantees to participate in the Exemplar Health Information Exchange Governance Entities awardee activities, as appropriate. Awardees will serve as key partners with ONC in demonstrating potential scalable national rules of the road for the electronic exchange of health information. Have operational governance for the electronic exchange of health information. This means the applicant has established and implemented policies, interoperability requirements and business practice requirements for participants’ query-based exchange, directed “push” exchange or both. Support the exchange of health information between unaffiliated healthcare organizations, health information organizations and across multiple vendors’ products. Have broad representation of stakeholders (i.e. as relevant healthcare providers, health IT vendors, consumers, health information organizations, etc.) in decision-making bodies and processes. ONC will work with awardees to develop and implement governance policies, interoperability requirements and business practice requirements addressing the national priority topics outlined below. Addressing these topics will support health information exchange in stages one and two of meaningful use and will facilitate implementation of innovative payment models. In areas where ONC has existing recommendations from the HIT Policy Committee or the HIT Standards Committee that ONC has considered and decided to implement, or has Standards & Interoperability Framework activities, those will be used as the starting point to develop solutions. Each applicant will work on national priority topics in their selected exchange model through this cooperative agreement and may also propose additional priority topics. ONC will work with each awardee to determine the final set of topics each awardee will work on under this cooperative agreement. If multiple awardees are working on the same or similar topics, ONC may instruct awardees to work together to establish a common solution. We define “directed push” exchange as a message sent from one participant to another, often to support anticipated and planned care. Examples include information that is sent by a hospital to another provider when a patient is referred or discharged from the hospital, lab results delivery or alerts to a primary care provider when a patient is seen in the emergency department. 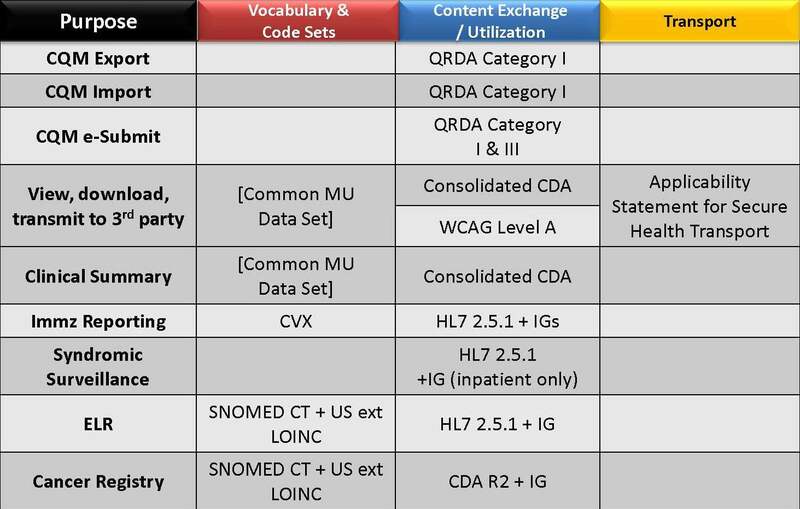 We define “query-based” exchange as models allowing providers to query for a patient’s health information, for instance when the patient arrives at an emergency department or at a specialist’s office without any clinical information. The Seventh Annual National Health IT Week is being held September 10-14, 2012. Health IT Week brings together the entire health IT community under one umbrella to raise awareness about the power of health IT to improve the quality, safety, and cost effectiveness of health care. The events of the week provide a key opportunity for key stakeholders-vendors, provider organizations, payers, pharmaceutical/biotech companies, government agencies, industry and professional associations, research foundations, and consumer groups- to work together to highlight critical issues and advance a shared vision of improving the nation's health and health care through health IT. During Health IT Week, ONC has developed a specific theme upon which to build each day's events. We hope you are able to join us for as many as your schedule allows. The 2012 Consumer Health IT Summit will bring together federal leaders including: Todd Park, U.S. Chief Technology Officer and Farzad Mostashari, National Coordinator, Office of the National Coordinator for Health Information Technology, and inspiring leaders from the private and non-profit sectors. ONC's Pledge Program has grown more than ten-fold since last year-the 2012 Consumer Health IT Summit is a chance to learn from and share your experiences with others who are leading the charge to empower consumers to be better partners in their health. Event will be Webcast Live at www.hhs.gov/live. The Health IT Blog Carnival is an open call for healthcare and IT industry bloggers who would like to comment on the impact health IT will have in 2013. This webinar will feature a new training tool from the Office of National Coordinator for Health IT (ONC) Privacy and Security Group. ONC will demo an interactive training game for providers and staff on the "do's and don'ts" of privacy and security issues regarding health IT. This training tool can be used to help fulfill a safety net provider's HIPAA privacy training requirements. In addition, ONC will provide a privacy and security update on recent program changes and how they affect safety net providers. The Patient Centered Primary Care Collaborative (PCPCC) is holding a webinar featuring speakers from CMS, ONC, and NCQA to discuss various aspects of health information technology and the patient-centered medical home. Please join us for a free and informative webinar from 2:00-3:30pm ET on Tuesday, September 11, entitled "Advancing Primary Care through Health Information Technology". As part of Health IT Week , National eHealth Collaborative (NeHC) will offer a series of programs with the Office of the National Coordinator for Health IT (ONC) to highlight their various initiatives, including those related to privacy and security. Joy Pritts, Chief Privacy Officer at ONC will kick off the program and Laura Rosas, Privacy and Security Professional at ONC and Will Phelps, HIT Cyber Security Program Officer with HHS, will provide an interactive demonstration of Cybersecure: Your Medical Practice, a new avatar-based game meant to enhance organizations' understanding of privacy and security. 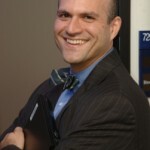 Continuing with the HIT Week Program Series, National eHealth Collaborative (NeHC) will offer a program with Deputy National Coordinator David Muntz and Director of the Office of Science and Technology, Dr. Doug Fridsma to lead a discussion on the progress of the Standards and Interoperability Framework. Dr. Holly Miller from MedAllies, Inc. and David Tao from Siemens Healthcare will discuss the S&I Framework from the perspective of a provider and a vendor respectively. Dr. Holly Miller, Chief Medical Officer, MedAllies, Inc. 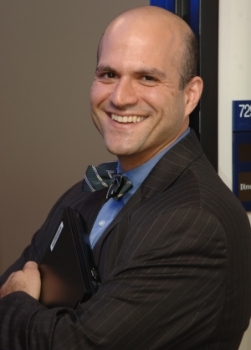 The final webinar of the HIT Week Program Series , National eHealth Collaborative (NeHC) will provide a program featuring Dr. Farzad Mostashari, Dr. Carolyn Clancy, and Dr. Patrick Conway to discuss how ONC, AHRQ, and CMS are collaborating to leverage health IT to improve healthcare quality. Speakers will provide a vision for the quality measurement enterprise of the future as well as the necessary steps to transition to health IT-enabled measurement, reporting and feedback that drives improvement in care and outcomes. They will also identify challenges moving forward in realizing this vision, including the need for continued public-private collaboration to continuously evolve and improve the enterprise. On Friday, September 14, @HIMSS and @HealthStandards are moderating at #HITsm Twitter chat on National Health IT Week at 12 noon ET. More details including chat questions will be shared on the HL7 Standards blog closer to the day. Find out 10 ways to get involved , whether externally in your community and/or by communicating the value of health IT within your own organization. View a full list of National Health IT activities taking places across the U.S. , or to visit the National Health IT Week website to learn more. It's also easy for individuals and organizations across the country to participate. Potential partners – including corporate, non-profit and academic institutions – should visit the National Health IT Week website Partners page to learn more about generating awareness of health IT in their communities. The National Institute of Standards and Technology (NIST) and the Department of Health and Human Services (HHS), Office for Civil Rights (OCR) co-hosted the 5th annual conference Safeguarding Health Information: Building Assurance through HIPAA Security on June 6 & 7, 2012 at the Ronald Reagan Building and International Trade Center in Washington, D.C. The conference explored the current health information technology security landscape and the Health Insurance Portability and Accountability Act (HIPAA) Security Rule. This event highlighted the present state of health information security, and practical strategies, tips and techniques for implementing the HIPAA Security Rule. The Security Rule set federal standards to protect the confidentiality, integrity and availability of electronic protected health information by requiring HIPAA covered entities and their business associates to implement and maintain administrative, physical and technical safeguards. The conference offered important keynote addresses and plenary sessions as well as breakout sessions following two learning tracks around specific areas of security management and technical assurance. Presentations covered a variety of current topics including updates on HHS health information privacy and security initiatives, OCR's enforcement of health information privacy and security activities, integrating security safeguards into health IT, safeguards to secure mobile devices, removing sensitive data from the Internet, and more. A single registration fee granted access to all presentations on-site and through a live Webcast. Video of the event is available at: http://www.nist.gov/itl/csd/hipaa-security-conference-2012-webcast.cfm. A live Twitter Chat was conducted using the hashtag #HIPAASecurity. Lunch and refreshments were served on-site. Presentations can be viewed from the NIST Computer Security Division's website known as Computer Security Resource Center (CSRC). NOTE: All presentations posted are in PDF format. Also note, when you click on the link to a presentation, the presentation will open up in a new browser window and this page will still be open in the background. The CMS and ONC Meaningful Use Stage 2 rules we just issued represent a massive step forward in advancing the secure exchange of information between providers and patients to support better care across the nation. Getting the right information to the right person at the right time can be a matter of life and death. Unfortunately, anyone who has been a patient or cared for a patient understands that it’s simply not happening today. Back in 2009 when we were drafting the initial set of meaningful use criteria and required standards, our hopes and expectations were subdued by the reality we faced. Different vendor products used different proprietary or local codes, there were strong disagreements about how laboratory results or patient summaries should be packaged, and there was simply no consensus on how the Internet could be used to securely send patient information. 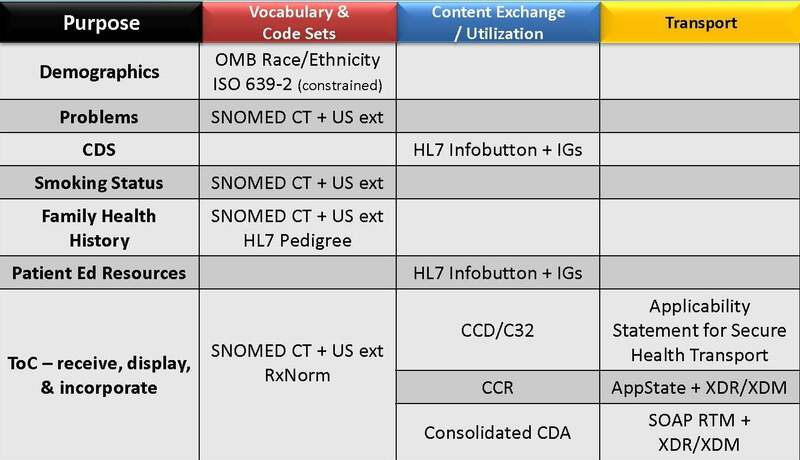 Over the past two years, thanks to the initial steps we took in Stage 1 and the relentless work of almost 1,000 volunteers in ONC’s standards and implementation activities, we can now leap towards interoperability and exchange in Stage 2. In addition, there are a host of detailed standards and implementation specifications for a number of other transactions including quality reporting, laboratory results, electronic prescribing, immunizations, cancer registries, and syndromic surveillance (see below for a detailed list). What does this mean? It means that we are able to break down barriers to the electronic exchange of information and decrease the cost and complexity of building interfaces between different systems while ensuring providers with certified electronic health record (EHR) technology have the tools in place to share, understand, and incorporate critical patient information. It also means that providers can improve workflow and dig deeper into the data. Certified EHR technology must be able to support identity reconciliation—matching the right record to the right person—and will give doctors the tools to reconcile a new document with the information already on file, for instance by incorporating medications and problems identified by another provider into a patient’s record, thus creating a single source of truth. 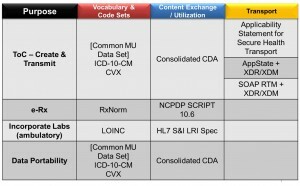 The Stage 2 regulations also require developers to build systems that allow each segment of the patient summary, whether it is procedures or lab results, to be retrievable by the end user, getting us closer to the goal of being able to efficiently search and assemble individual data elements through metadata tags. Rigorous Testing of Exchange for Stage 2: To ensure certified EHR technology supports providers in exchanging health information with greater frequency and across vendor boundaries, ONC will work with NIST to develop an interoperability testing platform for Stage 2 that will rigorously test that EHR technology can send, receive, and incorporate standardized data using the specified standards and protocols. Any EHR technology that meets the demanding testing requirements should be able to send and receive standardized information with other certified EHRs. We will need your help over the coming months to develop and vet the Stage 2 certification test scripts. Check back to www.healthit.gov soon for additional information on this initiative. Actual Electronic Exchange of Clinical Information: By 2014, providers will have to demonstrate, and vendors will have to support, the actual exchange of structured care summaries with other providers—including across vendor boundaries—and with patients. Whether through “push” or “query” methods, the requirements in the rule assure exchange is occurring while avoiding undue burden on providers and vendors to track and measure this exchange. As we stated unequivocally in the final rule (a dramatic reading of which is available ), we will pay close attention to whether the requirements in the rule are sufficient to make vendor-to-vendor exchange attainable for providers. If there is not sufficient progress or we continue to see barriers that create data silos or “walled gardens ,” we will revisit our meaningful use approach and consider other options to achieve our policy intent. While any rule-making includes some compromises between the aspirational goals we want to achieve and the reality of where the market is, we continue to make progress toward the ultimate goal of nationwide health information exchanges. By setting ambitious, but achievable targets for providers and vendors alike, I’m confident that we’ll see the same hockey stick progress we’ve seen for adoption of EHRs for information exchange. The push on standards-based information exchange and other Meaningful Use Stage 2 requirements will allow the country to make meaningful use of the meaningful use roadmap for more coordinated, safer, and better care. CMS Issued new version of FAQs in an Excel workbook in August 23, 2012. CMS EHR FAQs 2012 (ZIP) Excerpted from Downloads section on FAQs page on August 26, 2012. Workbook within zip file. As of 8/29/2012, THE ABOVE DOWNLOADABLE FILES HAVE BEEN WITHDRAWN AND ARE EXPECTED TO BE REPLACED SOON. What if the Home Office purchases the certified EHR technology for the Critical Access Hospital (CAH)? [EHR Incentive Programs] How does CMS define pediatrician for purposes of the Medicaid EHR Incentive Program? [EHR Incentive Programs] Will EHR Incentive Payments be subject to audits under OMB Circular A-133? [EHR Incentive Programs] Can eligible professionals (EPs) allow another person to register or attest for them? [EHR Incentive Programs] What is the purpose of certified electronic health record (EHR) technology? [EHR Incentive Programs] Who is Figliozzi and Company? [EHR Incentive Programs] What is Stage 2 for the Medicare and Medicaid EHR Incentive Programs? On August 23, 2013, the Centers for Medicare & Medicaid Services (CMS) released the final rule which establishes Stage 2 of the Medicare and Medicaid Electronic Health Record (EHR) Incentive Programs, updates Stage 1, and includes other program modifications. At the same time the Office of National Coordinator for Health IT (ONC) released the 2014 Edition Standards and Certification Criteria (S&CC) final rule which completes ONC’s second full rulemaking cycle to adopt standards, implementation specifications, and certification criteria for EHR technology. The CMS final rule specifies the Stage 2 criteria that eligible professionals (EPs), eligible hospitals, and critical access hospitals (CAHs) must meet in order to continue to participate in the Medicare and Medicaid Electronic Health Record (EHR) Incentive Programs. All providers must achieve meaningful use under the Stage 1 criteria before moving to Stage 2. The 2014 Edition S&CC final rule reflects ONC’s commitment to reduce regulatory burden; promote patient safety and patient engagement; enhance EHR technology’s interoperability, electronic health information exchange capacity, public health reporting, and security; enable clinical quality measure data capture, calculation, and electronic submission to CMS or states; and introduce greater transparency and efficiency to the certification process. The earliest that the Stage 2 criteria will be effective is in fiscal year 2014 for eligible hospitals and CAHs or calendar year 2014 for EPs. The table below illustrates the progression of meaningful use stages from when a Medicare provider begins participation in the program. Note that providers who were early demonstrators of meaningful use in 2011 will meet three consecutive years of meaningful use under the Stage 1 criteria before advancing to the Stage 2 criteria in 2014. All other providers would meet two years of meaningful use under the Stage 1 criteria before advancing to the Stage 2 criteria in their third year. In the first year of participation, providers must demonstrate meaningful use for a 90-day EHR reporting period; in subsequent years, providers will demonstrate meaningful use for a full year EHR reporting period (an entire fiscal year for hospitals or an entire calendar year for EPs) except in 2014, which is described below. Providers who participate in the Medicaid EHR Incentive Programs are not required to demonstrate meaningful use in consecutive years as described by the table above, but their progression through the stages of meaningful use would follow the same overall structure of two years meeting the criteria of each stage, with the first year of meaningful use participation consisting of a 90-day EHR reporting period. For 2014 only, all providers regardless of their stage of meaningful use are only required to demonstrate meaningful use for a 3-month EHR reporting period. For Medicare providers, this 3-month reporting period is fixed to the quarter of either the fiscal (for eligible hospitals and CAHs) or calendar (for EPs) year in order to align with existing CMS quality measurement programs, such as the Physician Quality Reporting System (PQRS) and Hospital Inpatient Quality Reporting (IQR). The 3-month reporting period is not fixed for Medicaid EPs and hospitals that are only eligible to receive Medicaid EHR incentives, where providers do not have the same alignment needs. CMS is permitting this one-time 3-month reporting period in 2014 only so that all providers who must upgrade to 2014 Certified EHR Technology will have adequate time to implement their new Certified EHR systems. Stage 2 uses a core and menu structure for objectives that providers must to achieve in order to demonstrate meaningful use. Core objectives are objectives that all providers must meet. There is also a predetermined number of menu objectives that providers must select from a list and meet in order to demonstrate meaningful use. EPs must meet 17 core objectives and 3 menu objectives that they select from a total list of 6, or a total of 20 core objectives. Eligible hospitals and CAHs must meet 16 core objectives and 3 menu objectives that they select from a total list of 6, or a total of 19 core objectives. All providers are required to report on CQMs in order to demonstrate meaningful use. Beginning in 2014, all providers regardless of their stage of meaningful use will report on CQMs in the same way. EPs must report on 9 out of 64 total CQMs. Eligible hospitals and CAHs must report on 16 out of 29 total CQMs. A complete list of 2014 CQMs and their associated National Quality Strategy domains will be posted on the Clinical Quality Measures tab in the future. CMS will also post a recommended core set of CQMs for EPs that focus on high-priority clinical conditions. For more detailed information on 2014 CQMs and electronic reporting options, click to download our 2014 Clinical Quality Measures Tipsheet.